Pennsylvania and parts of Maryland are under a pest alert for the spotted lanternfly (lycorma delicatula). Native to China, Bangledesh, Vietnam and introduced to Japan and Korea where is has become a major pest of grapes. The invasive spotted lanternfly has the potential to greatly impact the grape, hops and logging industries in PA and beyond. Several counties in eastern PA, including Berks, Delaware and Lancaster counties, are under quarantine. The spotted lanternfly is moving steadily westward across the southern tier of the state. If you live outside the current quarantine area in PA and find a spotted lanterfly in any life stage, report it! 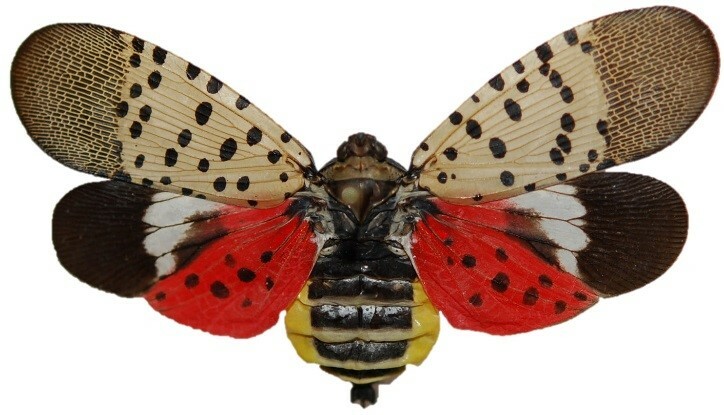 The Spotted Lanternfly adult is approximately 1″ long and 1/2″ wide at rest. The forewing is grey with black spots and the wings tips are reticulated black blocks outlined in grey. The hind wings have contrasting patches of red and black with a white band. The legs and head are black; the abdomen is yellow with broad black bands. Immature stages are black with white spots, and develop red patches as they grow. The spotted lanternfly feeds on many types of plants but strongly prefers Tree of Heaven. Attacked trees will develop weeping wounds. These wounds will leave a greyish or black trail along the trunk. 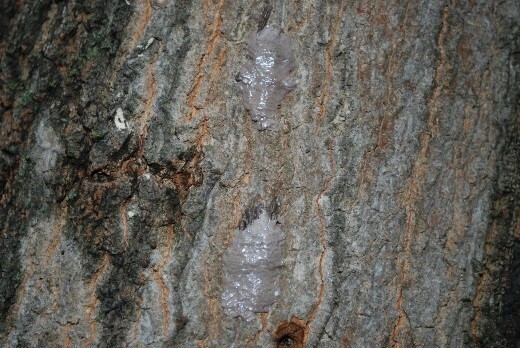 This sap will attract other insects to feed, notably wasps and ants. In late fall, adults will lay egg masses on host trees and nearby smooth surfaces like stone, outdoor furniture, vehicles, and structures. Newly laid egg masses have a grey mud-like covering which can take on a dry cracked appearance over time. Old egg masses appear as rows of 30-50 brownish seed-like deposits in 4-7 columns on the trunk, roughly an inch long. In addition to threatening ornamental landscapes and agricultural commodities, spotted lanternflies leave a sap like “honeydew” as they feed. This residue has a sugary content and attracts other outdoor pests like wasps and ants and is readily colonized by sooty mold that is extremely difficult to remove from outdoor patios, outdoor furniture, vehicles and structures making enjoyment of your outdoor spaces difficult. If you see egg masses, scrape them off, double bag them and throw them away. You can also place the eggs into alcohol or hand sanitizer to kill them. Please report sightings of egg masses, nymphs, or adult spotted lanternfly using this tool provided by our partners Penn State ExtensionOpens In A New Window. Report a site: If you can’t take a specimen or photograph: report your sighting using this online toolOpens In A New WindowOR call the Automated Invasive Species Report Line at 1-888-4BAD-FLY and leave a message detailing your sighting and contact information. Remove Tree Of Heaven plants from your property. If you notice the egg masses on surfaces, destroy them. When there are only a few insects, you can kill spotted lanternflies by swatting or crushing them. If there are large populations, there are several contact and systemic insecticides available that will kill them. As with all pesticides, follow label instructions or hire a licensed professional. Contact Hively Landscapes for more information on Tree of Heaven removal and pest control. *Adapted from the Pennsylvania Department of Agriculture and the Maryland Department of Agriculture. Photo credits: Pennsylvania Department of Agriculture. Posted in Information, Landscape Maintenance, Pest Control and tagged agricultural damage, control, identification, invasive pest, ornamental landscape damage, outdoor living, prevention, quality of life, sightings, spotted lanternfly on November 26, 2018 by Ted Ventre.